Performers include: Daniel J. Travanti, Bruce Weitz, Betty Thomas, Michael Warren, Taurean Blacque, Kiel Martin, Charles Haid, Veronica Hamel, James Sikking, Joe Spano, Barbara Bosson, Rene Enriquez, Ed Marinaro, Robert Hirschfeld, Michael Conrad, Jon Cypher, George Wyner, Lisa Sutton, Ellen Blake, Trinidad Silva, Gary Miller, Rober Prosky, Tony Perez, Arthur Taxier, Dean Wein, Ken Olin, Barbara Babcock., Jeffrey Tambor, Dennis Franz, Larry D. Mann, Mimi Kuzyk, Deborah Richter, Zero Hubbard. Gerry Black, J.A. Preston, Vincent Lucchesi, Andy Romano, Peter Jurasik, Nick Savage, and Marco, Rodriguez. A ground-breaking police drama that was an immediate critical success because of its realistic and gritty portrayal of life in an urban judicial system. 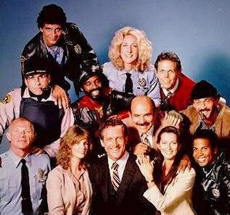 Complex storylines featured characters like Captain “Frank” Furillo (Daniel J. Travanti); his ex-wife Fay Furillo (Barbara Bosson); public defender Joyce Davenport (Veronica Hamel); Detectives “Mick” Belker (Bruce Weitz), J.D. LaRue (Kiel Martin) and Neal Washington (Taurean Blacque); Lieutenants Ray Calletano (Rene Enriquez), Norman Buntz (Dennis Franz), and Howard Hunter (James B. Sikking); Sergeants Henry Goldblume (Joe Spano) and “Phil” Esterhaus (Michael Conrad); and Officers “Bobby” Hill (Michael Warren), “Andy” Renko (Charles Haid), “Lucy” Bates (Betty Thomas), and Joe Coffey (Ed Marinaro). This was my favorite cop show. I never missed an episode. Wish they would do a remake of it. This was my favorite cop show of all time. Never missed an episode.